After an election where the issue saw little mainstream political attention, climate change and what to do about it has come roaring back to the forefront of the New York political scene. Whether it’s because of a recent federal report outlining the economic damage climate change will cause if left unchecked, because New York Representative Alexandria Ocasio-Cortez has used her bully pulpit to push a Green New Deal, or the potential for more action after Democrats won control of the state Senate, there’s increased attention on both new and old legislation to try to beat back rising oceans, extreme weather and their effects. At both the state and city levels, efforts to combat climate change are likely to be significant topics of discussion in 2019. Governor Andrew Cuomo, a Democrat starting his third term, has increasingly spoken out about the climate crisis during his time in office, even if his ideas and rhetoric haven’t always been what climate activists want from him. The state’s Reforming Energy Vision has set energy efficiency goals (a 600 trillion British thermal units efficiency increase) and renewable energy goals (50 percent of electricity) for the year 2030, and Cuomo helped to establish the U.S. Climate Alliance, a group of 16 states that have agreed to take measures to get their greenhouse gas emissions down to the level set by the Paris Agreement, despite President Donald Trump’s rejection of it. The governor also made news with a pair of announcements recently. First, he announced a new New York State Public Service Commission regulation that mandates utilities find ways to cut 31 trillion British thermal units of site energy (which is the heat and electricity consumed by a building), to move towards the goal of saving 185 TBtus 2025 (an energy efficiency framework that the governor said could create 50,000 jobs by 2025) along with an investment of hundreds of millions of dollars to develop better energy storage capabilities statewide. 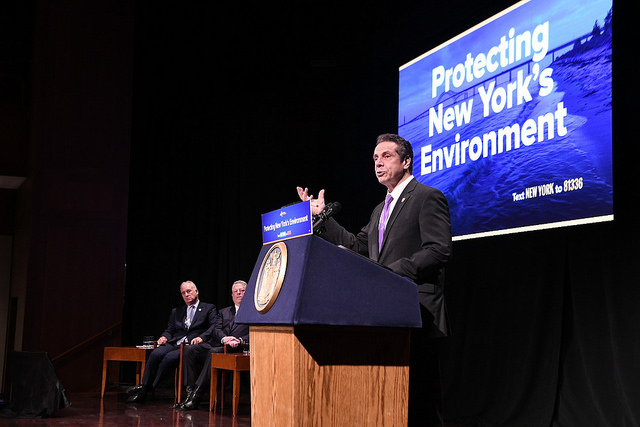 Second, Cuomo gave a December speech outlining his 2019 legislative agenda, and called for a Green New Deal for New York, though he gave few details. While Cuomo’s Green New Deal is unlikely to look like a state-level version of the one Ocasio-Cortez is pushing nationally, the dual goals of such a program are reducing greenhouse gas emissions by enhancing renewable energies and creating green jobs. Still, his initial position falls short of what the state’s most vocal climate change activists are calling for. Those activists, who have formed the NY Renews coalition, reacted to Cuomo’s announcement by putting together a slick movie trailer with footage of climate disasters and a press release pointing out that electricity is 20 percent of the state’s total carbon footprint, all in service of continuing to push their gold standard: the Climate and Community Protection Act. What the ramp up to transition away from fossil fuels will look like is not laid out in detail by the bill, instead the text requires the creation of a New York State Climate Action Council and directs the Department of Environmental Conservation to establish greenhouse gas emissions limits and regulations to achieve those limits. 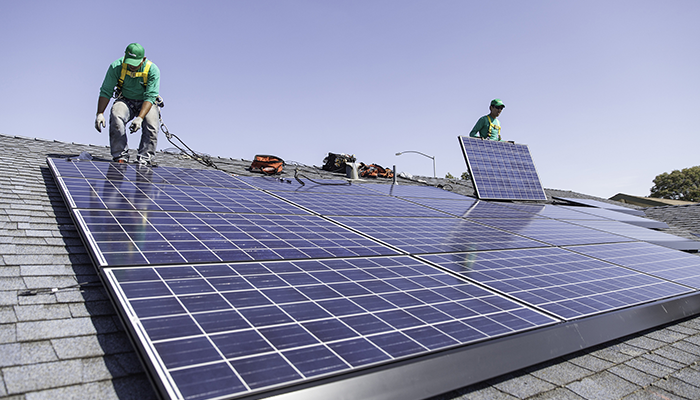 The bill also establishes a Climate Justice Working Group, which would study how to expand renewable energy into disadvantaged communities and would “have a role in determining what that investment would look like,” Hoylman said. Whether that means a heavy hand from the state or not is something that’s been up for debate, and a place where Cuomo’s proclamation means he may soon weigh in. In a previous interview with Gotham Gazette, three-time Green Party gubernatorial candidate Howie Hawkins -- who has been running on a Green New Deal for New York since the 2010 race -- suggested that it would take “a World War II-scale mobilization” to prevent catastrophic damage from climate change. “During World War II we nationalized 25 percent of manufacturing in this country to make sure we could turn on a dime to make the weapons we used to beat the Nazis. The private investor-owned utilities and energy companies, they haven't led the way to clean energy, so we may need more public ownership,” Hawkins suggested. In Hoylman’s view, the state doesn’t have to seize the means of production or even take on the role of primary investor, as much as it should shape where the market moves money. As the CCPA has languished in the Republican-ruled state Senate, and the years tick closer to 2030, Hoylman said he understands the need to move fast on the legislation when his party takes the helm. Hoylman also said that he is sensitive to the challenge that Democrats have in passing the CCPA and the Climate and Community Investment Act, which would help fund transition efforts through a carbon tax, while avoiding the pitfall of looking like the tax-hiking and regulation-spewing liberals Republicans warned they would be, but that inaction would be even worse. Whatever any final Green New Deal for New York looks like will be a product of negotiations between Cuomo and the Legislature, possibly as part of the late March or early April state budget agreement for the next fiscal year. As Kaminsky indicated, while the CCPA is the main event of this year’s legislative session when it comes to climate change activism, there’s a lot on the undercard that the state has been grappling with. While public transit is usually thought of as the domain of New York City and the surrounding metro area, and the governor’s Buffalo Billion II program doesn’t have the cleanest lineage, advocates for a Buffalo light rail expansion are hoping Senator Tim Kennedy’s place as chair of the Transportation Committee will mean more funding for expanding the system as the city determines the best path forward. Elsewhere, the state is pushing for renewable energy with an RFP out asking for vendors to deliver 800 megawatts of offshore wind power (with winners to be announced in the spring of 2019) which was a goal in Cuomo’s 2018 State of the State book, and the NY-Sun initiative, which offers education and financing for solar projects and has supported almost 90,000 solar projects around the state. Outside of the Legislature and the governor’s mansion, there’s also the ongoing argument over Comptroller Tom DiNapoli’s management of the state pension fund, which is worth more than $200 billion. Environmental advocates have pressed DiNapoli to divest the state’s pension funds from fossil fuel companies, a move that they say would not only hurt companies who contribute to greenhouse gas emissions, but also make the state pension fund more money. DiNapoli, for his part, has argued against making any sudden, sweeping moves without studying their impact, and that he has a fiduciary duty to get the best return possible for the state, while also putting $10 billion in state pension funds in a low-emissions and clean energy indexes. He’s also argued that by being an activist investor, he can push the companies toward more climate-friendly policies. Part of OneNYC is the de Blasio administration’s target for emissions cutbacks, the goal of reducing greenhouse gas emissions by 80 percent by the year 2050. The Mayor’s Office of Sustainability put out a Roadmap to 80x50 in 2016 that set a path for emissions reductions by way of energy standards for buildings, expanding the use of renewable energy, increasing the use of mass transit and reducing the amount of waste sent to city landfills. The city is set to begin construction on the “Big U,” a coastal resiliency measure made up of parkland and berms around lower Manhattan to protect it from flooding, in spring 2020, according to the most recent news provided by the de Blasio administration. The updated plan for the flood protection, which involves raising the East River Park, has been criticized though, for making the project costlier in what critics say is an effort to not inconvenience drivers on the FDR Drive and avoiding dealing with the Parks Department’s lack of any kind of post-storm maintenance budget. After the mayor got out ahead of allies and even his office with proposed energy efficiency mandates regarding retrofitting and caps on the amount of fossil fuels buildings can burn, the exact ideas he’d proposed never really took off. But, a recently-introduced pair of bills from Queens City Council Member Costa Constantinides run with the idea, and if passed, would introduce new emissions standards for many buildings 25,000 square feet or larger. Since large buildings account for two-thirds of the city’s greenhouse gas emissions, backers of the Constantinides bills see retrofitting large buildings by doing things like installing energy efficient HVAC systems, hot water heaters, and electricity and lighting, as one of the most effective ways for the city to cut those emissions 80 percent by 2050. The bills, which had their first hearing in December, would open an Office of Building Energy Performance that can set new buildings emissions standards and also establish a financing program to help the owners of some buildings finance efforts to retrofit their properties to reach the emissions targets the office sets out. Mark Chambers, director of the de Blasio administration’s Office of Sustainability, told the City Council that the laws could create over 14,000 jobs related to the efforts to retrofit buildings and praised the establishment of a New York City PACE financing program as a way to make sure that property owners themselves aren’t burdened by the efficiency upgrades. Elsewhere, activists who started a campaign this summer to establish a public bank in New York City recently rallied at City Hall to connect the potential municipal bank with efforts to fight climate change on a local level. First, advocates say that taking billions of city deposits away from larger banks like Chase and Bank of America, who finance fossil fuel extraction with some of their money, would be as effective a strike against fossil fuel reliance as the city’s underway efforts to divest its public pension funds from fossil fuel stock. Additionally, advocates say that a public bank would allow for cheaper financing of small-scale renewable energy projects that will be necessary in the coming transition away from fossil fuels. “Waterfront solar projects, community solar projects, all of those kind of projects could be funded more easily if the intermediaries that were trying to do the good work didn't have to go to their very limited pots of money or could get money out of somebody bigger who wasn't predatory,” Stephan Edel, the director of the New York Working Families Project at the Working Families Party, told Gotham Gazette. And while Edel had praise for the pension funds and the state’s green bank as effective tools in the transition to a green economy, he also said that a public bank could lend to projects that return on their investment somewhat slower. “A public bank still has to make safe investments, has to make that limited return, but it can look at a longer term set of benefits and it can look at investments that can have a long-term benefit because it's not looking to get its return in a quarter or make nine percent,” he said. 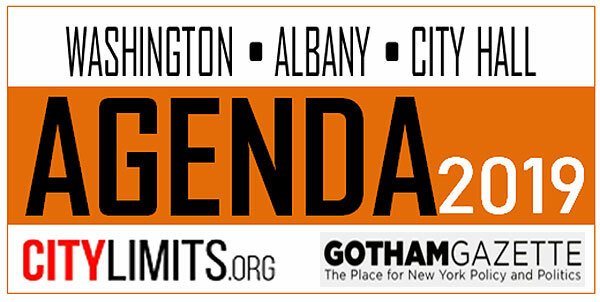 As for the proposal’s legislative future, the New Economy Project’s Ali Issa told Gotham Gazette that the Public Bank NYC coalition is working with “an array of state and city elected officials, including Council Member Mark Levine” to put a proposal for the bank forward in 2019. Alexandria Ocasio-Cortez’s draft resolution for a Green New Deal has sparked new momentum for climate action among progressives and young people across New York and beyond. Not only is her federal proposal spreading like wildfire on social media, but group after group — from the Sunrise Movement to Moveon to Indivisible to 32BJ SEIU — is mobilizing thousands of activists in support of the message. Four members of New York’s congressional delegation have already endorsed Representative-elect Ocasio-Cortez’s proposal, thanks to constituent pressure: Reps. Carolyn Maloney, Jose Serrano, Adriano Espaillat, and Nydia Velazquez. And now even Governor Cuomo is on the Green New Deal train. Just Monday, in his speech outlining his 2019 legislative agenda, he declared his own intention to enact a so-called “Green New Deal” in New York. Cuomo is right that here in New York we don’t have to wait on the federal government for our own Green New Deal. We must take immediate action to cut carbon emissions and shift to renewable energy, while creating green jobs. What he failed to mention, however, is that the New York State Assembly has already passed what is essentially a Green New Deal for New York several years in a row. And that version is better than what Cuomo sketched on Monday, which he said would “make New York's electricity 100% carbon neutral by 2040 and ultimately eliminate the state’s entire carbon footprint,” though he gave no timetable for that. The Climate and Community Protection Act (CCPA) would compel the state to invest in green jobs, renewable energy, and community development while setting meaningful, enforceable targets for reducing carbon emissions for all energy sectors to zero by 2050. This is the Green New Deal we need for New York. Like Ocasio-Cortez’s proposal, the CCPA is a visionary climate justice bill: it ensures that our transition to renewable energy will protect society’s most vulnerable, and treats climate action as an opportunity to create fair-paying union jobs and grow the economy. And unlike the electricity-focused vision outlined in Cuomo’s speech, the CCPA would cut emissions to zero for all sectors and prioritize investing in communities that suffer most from climate consequences. Up until now, the CCPA has failed to come to the floor for a vote in the State Senate, which has been controlled by Republicans. So too it has been mostly ignored by Governor Cuomo while it languished. 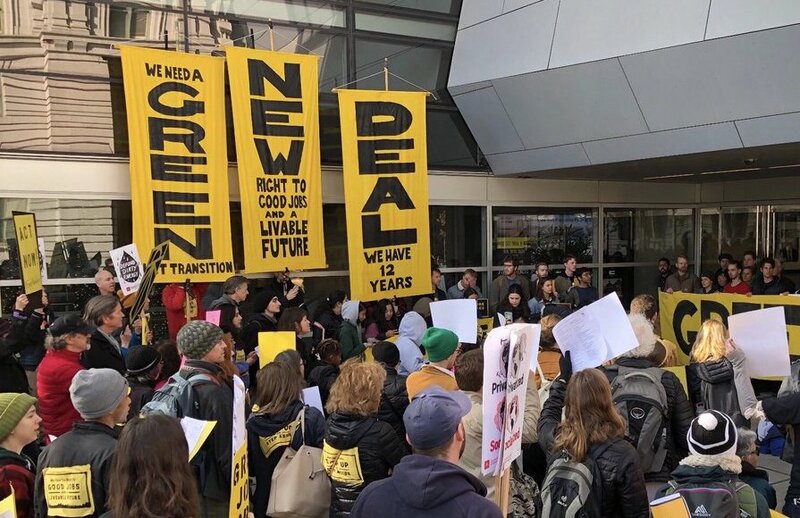 But in 2019, with an overwhelming Democratic majority in both the Assembly and Senate and early indications from the governor that he wants to capitalize on the Green New Deal’s momentum, New York leaders can and should make the Climate and Community Protection Act state law. Not all Green New Deals are created equal. As with federal level climate action, the CCPA has broad support among voters. The CCPA and its companion bill, the Climate and Community Investment Act — an “upstream” tax on corporate polluters that would fund the CCPA’s just transition — are supported by NY Renews, a growing coalition of nearly 150 grassroots organizations and labor unions across New York. These are the same groups that propelled Democrats to victory and a new Senate majority, and who will be able to collectively mobilize hundreds of thousands of people across the state for what comes next. As this year’s federal report on the economic cost of climate inaction illustrates, we cannot afford to wait any longer to pursue transformational climate action. According to the new report from the Intergovernmental Panel on Climate Change (IPCC), we have just ten years to drastically reduce carbon emissions in order to avoid climate catastrophe. With a pro-polluter President and a divided Congress, it is life-or-death essential for blue states, especially states with large economies like New York, to take the lead on eliminating emissions, shifting to renewables, and investing in climate resiliency now, in 2019. In just a few weeks, Cuomo and legislators will have a chance to immediately pass the Climate and Community Protection Act. It is not just about reducing emissions or reaching “carbon neutrality,” it’s about justice and the bold comprehensive change needed to successfully protect humanity from climate crisis. It’s been ready and waiting in the wings and now it’s ready for the spotlight. Legislators and Governor Cuomo should follow through on their promises and pass the Climate and Community Protection Act this year and make a true Green New Deal for New York a reality. Liat Olenick is a public school science teacher, union leader, and co-president of non-profit Indivisible Nation BK. On Twitter @Liat_RO. A “Green New Deal” for New York could mean thousands of jobs and a pathway to 100% renewable energy, which will be necessary to stave off the worst effects of climate change, all paid for by charging a fee on corporate polluters that pump greenhouse gases into the atmosphere. We are coming off a record-breaking forest fire season on the West Coast while Hurricane Florence has ravaged the Carolinas, a year after Maria devastated Puerto Rico. And, at least in the short term, national leaders will keep their heads in the sand and continue to collect campaign donations from the fossil fuel industry. 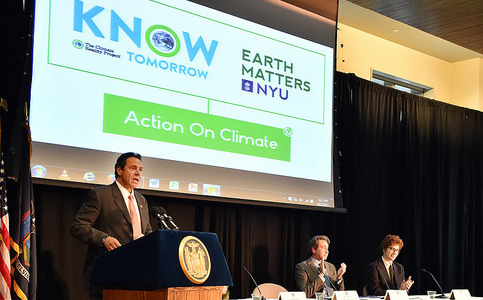 States have the opportunity to set the model for how to tackle climate change, and New York can and should be one of these states. While Governor Cuomo has taken important steps to address climate change, including banning fracking in the state and creating the United States Climate Alliance (the coalition of states that committed to the Paris Accords following the country’s exit), New York actually lags behind other states. Only 5% of New York’s energy come from renewable sources -- compared with California’s 25% and Vermont’s 40% -- and there are multiple plans to build more fossil fuel infrastructure, guaranteeing a continued reliance on dirty energy. 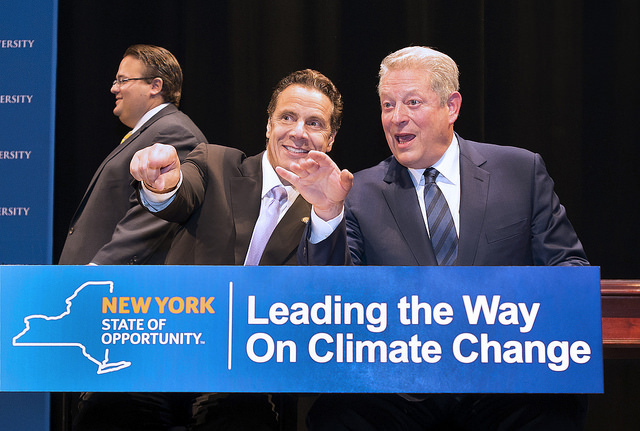 To truly be a climate leader and make the state the progressive model he often says it is (and position himself for any aspirations beyond Albany), Cuomo needs to pass bold legislation that puts New York on a path to 100% renewable energy. After all, just last week, Governor Jerry Brown of California signed into law major legislation that will do just that. What’s more, with the victories of a progressive wave of state senators on primary day, September 13, state government may be ripe for bold climate legislation this session. And that legislation already exists. Two bills with strong support among grassroots and labor organizations, the Climate and Community Protection Act (CCPA) and the Climate and Community Investment Act (CCIA), would put New York on a trajectory towards 100% renewable energy. The CCPA calls for a just and equitable transition to a clean energy economy, while the CCIA would force those most responsible for climate change to foot the bill by charging a fee on corporate polluters. These bills would not only set a strong climate agenda, but would also launch a necessary jobs program at a time where there’s national concern over loss of jobs due to automation and outsourcing. 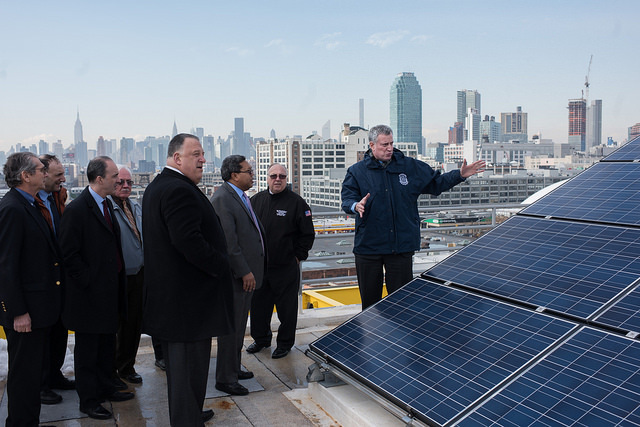 By investing in renewable energy and energy efficiency, New York could create thousands of jobs that pay a living wage including retrofitting buildings, installing solar panels, and updating our energy infrastructure. We could also put people to work making our state more resilient, and fix crumbling infrastructure that is increasingly vulnerable due to superstorms and sea level rise. By charging a fee on oil, gas, and coal, this all will be paid for by the fossil fuel industry, without a need to raise taxes on New Yorkers. A “Green New Deal in New York” could be the benchmark for other states and eventually the country to follow. It is no longer enough for politicians to claim that they “believe” in climate change. We need a real, comprehensive agenda to address this challenge head-on. In order to demonstrate climate leadership, Cuomo, assuming he wins reelection, should work with the Legislature to pass the CCPA and the CCIA as quickly as possible and set the example for the rest of the nation. Ari R. Lieberman is an attorney and the legislative coordinator for 350Brooklyn, a grassroots climate change organization affiliated with 350.org. On Twitter @the_greenmarble.